Initially settled in the early 19th century, Vermilion Ohio was a commercial harbor for a number of years. It was home to many ship captains . As the commercial aspect of the harbor faded, the focus moved to recreational boating. Today, Vermilion has over 3,000 slips and is a highly-regarded stop-over for cruising sailors. With its many lagoons, it has been called by some the 'Venice of Lake Erie'. The approaches to Vermilion Ohio are clear from all directions. There is a detached breakwater across the mouth of the channel entrance. The wall is marked with 3 WHITE lights ( Q, Fl, and Q) at either end and in the middle. The channel entrance itself is marked with a Fl RED on the end of the west breakwater and a Fl GREEN on the end of the east breakwater. NOTE: There is a Fl RED light (charted) located to the West of the harbor entrance. This is situated on the grounds of the Inland Seas Maritime Museau. DO NOT CONFUSE IT WITH THE HARBOR ENTRANCE. Upon entering Vermilion Ohio, a cruising sailor has a number of docking options. VYC is on the east side of the river, immediately upon entering. It is an I-LYA member club. They keep a number of berths available for affiliated cruising sailors. They have a fuel dock (diesel and gasoline) and pump-out station. They have a beautiful clubhouse that is designed for quiet relaxing. There are restrooms, showers, laundry and kitchen facilities available. The grounds are lovely and there are BBQ grills available. The Municipal Docks are the first docks you will see on the west side of the river. There are approximately 2 dozen transient slips. There is no fuel dock but a pump-out station is available. There is water and power available at the slips. Internet access is available. Because of its central location, many restaurants, pubs and shops are in the immediate vicinity. VBC is located on the west side of the river, south of the yacht club. A member of I-LYA, it offers reciprocal privileges to affiliated transient sailors. There is water and power dockside. Their clubhouse has restrooms and showers. They have a lounge and dining room with outdoor deck. Other amenities include a swimming pool, picnic areas and BBQ grills by the river and internet service. This is a small, delightful municipal park immediately south of the Vermilion Boat Club. There are several transient slips available. There is no fuel dock or pump-out station. There is water and power at each slip. Restrooms are available. This is a beautiful, landscaped park located within a block or two of downtown shops. Moes Marine Service is located on the west side of the river, well around the bend. It is a full-service marina with several transient slips available. There is no fuel dock but there is a pump-out station. Water and power are available. There are restrooms. Moes specializes in wooden boats and woodworking although they also carry out a wide range of repairs and maintenance on other types of vessels including rigging work and fiberglass repairs. There is a travel lift. Parsons is a full-service marina. They have transient slips for several boats. There is no fuel dock but there is a pump-out station. Water and power are available at the slips. They offer a complete range of repair and maintenance services including work on engines, mechanical systems, fiberglass, canvas and rigging. Towing service is available as is haulout. Vermilion Power Boats is located on Huron Lagoon which runs east from the main channel (4th lagoon from the river mouth). This marina and yacht club is an I-LYA member and has several slips available for transients. There is a fuel dock (diesel and gasoline) and pump-out station. Repair and maintenance services include diesel and gasoline engine repairs, electrical and fiberglass maintenance work. There are restrooms, showers and laundry facilities available. Local shops and restaurants are within walking distance. There is a Giant Eagle supermarket located approximately 1 mi/1.6 km east of the river. This is a full-service grocey store with a complete range of products. There is a Food Mart across the road from the Vermilion Boat Club which carries a good range of basics. There are a number of banks in Vermilion. Flagstar Bank is the closest to the waterfront. Mercy Regional Medical Center (440-960-4000) is located 8 mi/13 km east of Vermilion Ohio. There are several pharmacies in Vermilion. The closest is Rite Aid (440-967-2048). Old Prague Restaurant specializes in traditional Czech cuisine - a treat in this lake Erie community. Chez Francoise specializes in authentic French cuisine. The atmosphere is more formal, and that includes dress as well - no t-shirts and scuffed boat shoes here. But the dining is worth it. Quaker Steak and Lube is located at McGarvey's Landing, right on the river. Good casual dining accompanied by a terrific riverview. Granny Joe's Ice Creamatorium is a perfect place for dessert with a wide section of delicious frozen treats. Brummer's Homemade Chocolates will satisfy the chocolate cravings of any crewmwmber. There are lots of other small restaurants and specialty shops waiting to be discovered in and around Vermillion. Vermilion Ohio is just a great summer place to visit and enjoy. Much activity centers around the river and the riverfront. The Vermilion Fish Festival is held annually around the 3rd weekend in June. This is a 4 day celebration and transient docking is hard to secure. Plan ahead if you want to take in this event. The Mystic Belle is a paddle-wheel boat that cruises the Vermilion River and the lagoons of the community. The Inland Seas Maritime Museum is a replica of the original lighthouse. The original one now sits off Cape Vincent at the entrance to the St. Lawrence River. Currently located in Vermilion, the Museum plans to move to Toledo, OH. 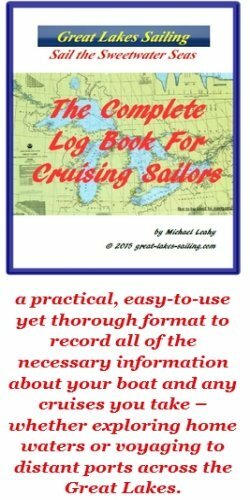 This is a must-see place for any sailor with more than a passing interest in our fabulous Great Lakes. The "Discover Vemilion" page of this Vermilion Ohio site will give you many ideas on getting the most of your visit.